My next destination was Bamberg, a beautifully-preserved old city in northern Bavaria, near Nürnberg. 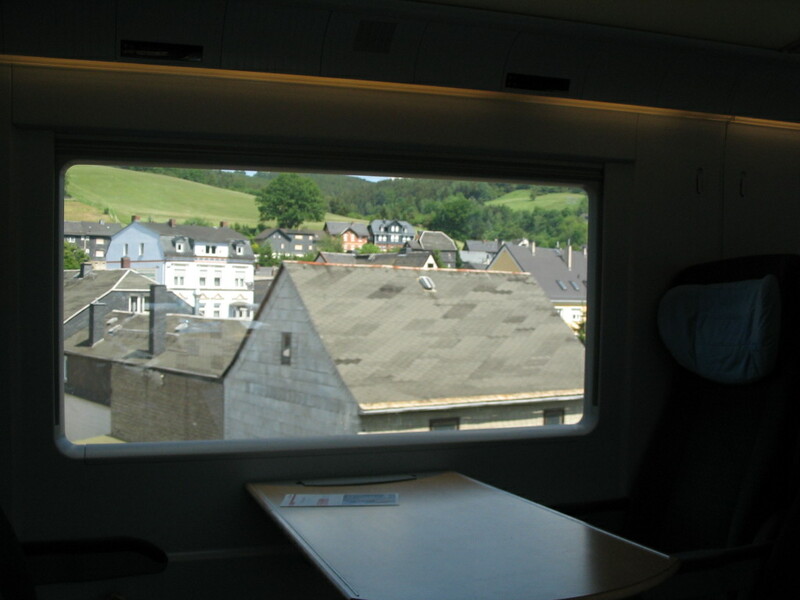 The four-hour ride thither went through pleasant countryside and several cities and towns within six states: Berlin, Brandenburg, Saxony, Saxony-Anhalt, Thuringia, and Bavaria. 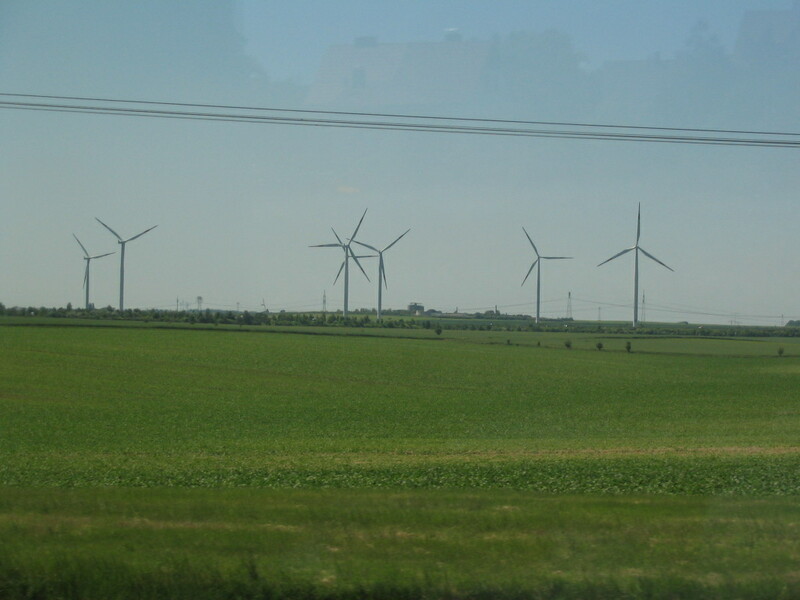 A bumper crop of wind turbines and fence posts. 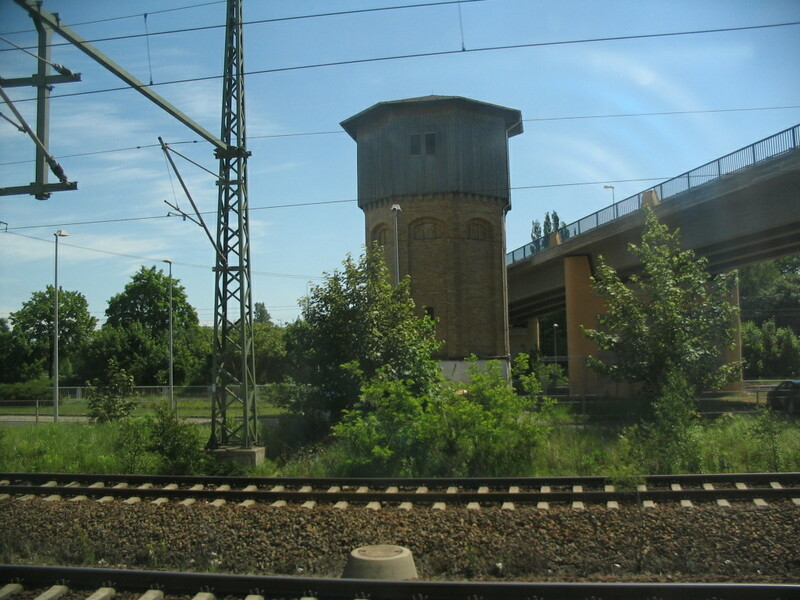 A cool old octagonal tower, somewhere after the Lutherstadt-Wittenberg station in Saxony-Anhalt. 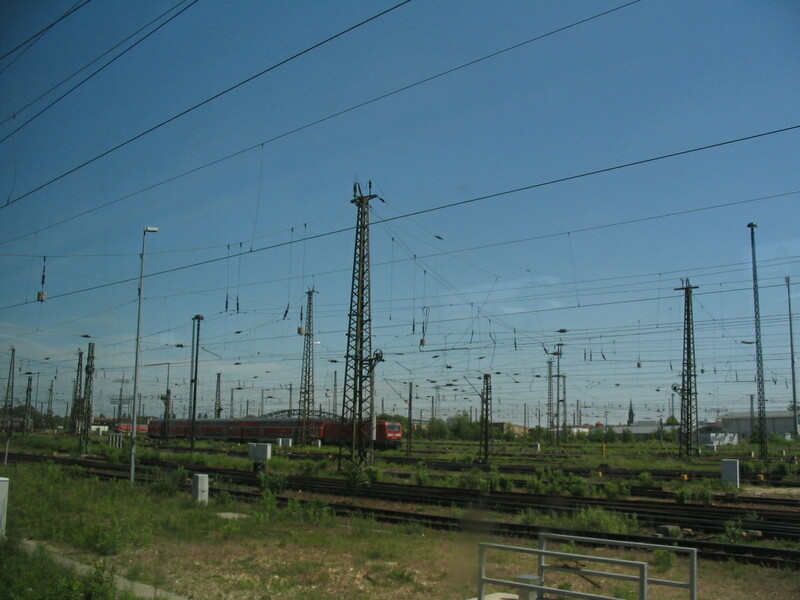 An extensive network, in a very literal sense. 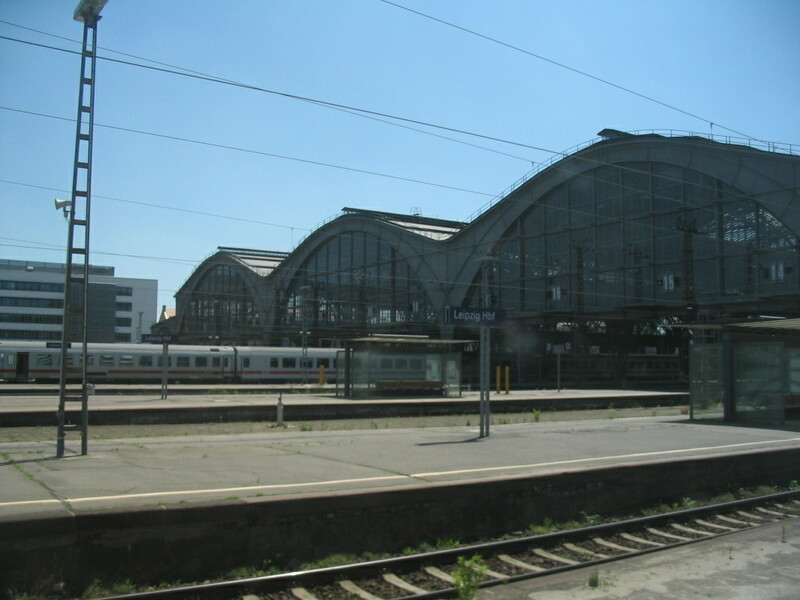 Leipzig Hauptbahnhof, built in 1915, has this lovely light-looking iron-arch structure for its trainsheds. 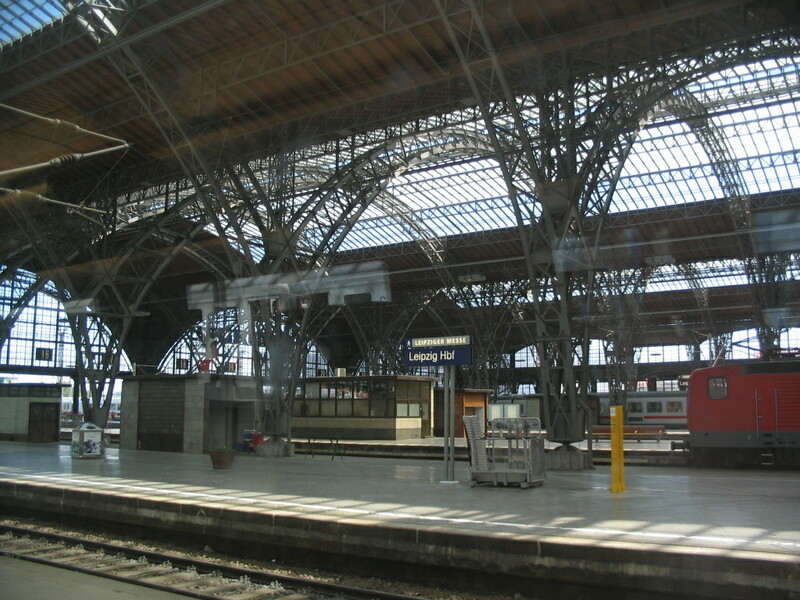 According to Wikipedia it's the largest rail station in Europe by floor area. 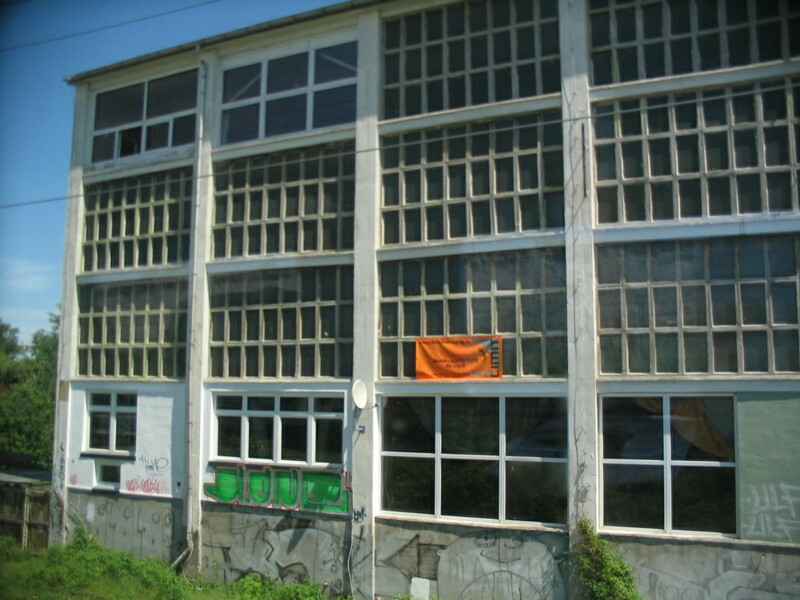 A front view of the curves of the sheds as we departed. This place looks ripe for some landscape urbanism. Flea-sized trees. 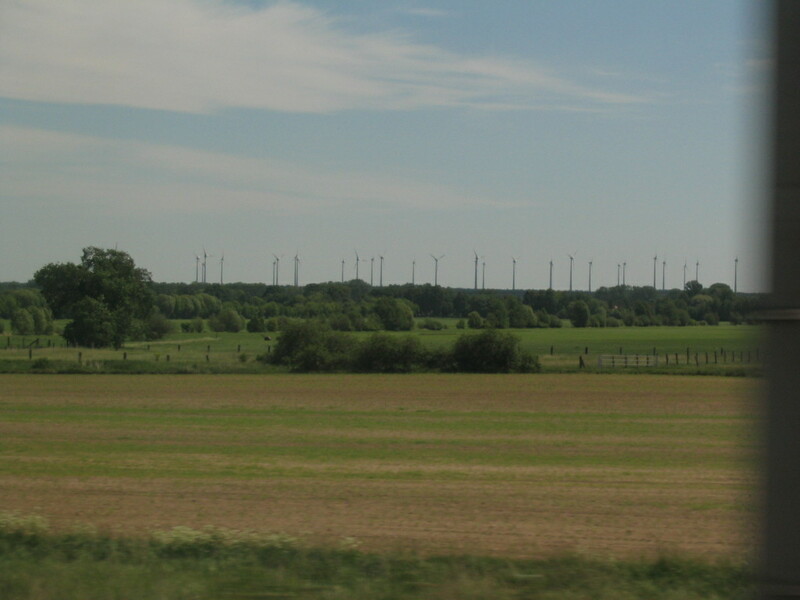 The route between Leipzig and Jena upcoming was through a bit of Saxony, another corner of Saxony-Anhalt, and a bit of Thuringia. 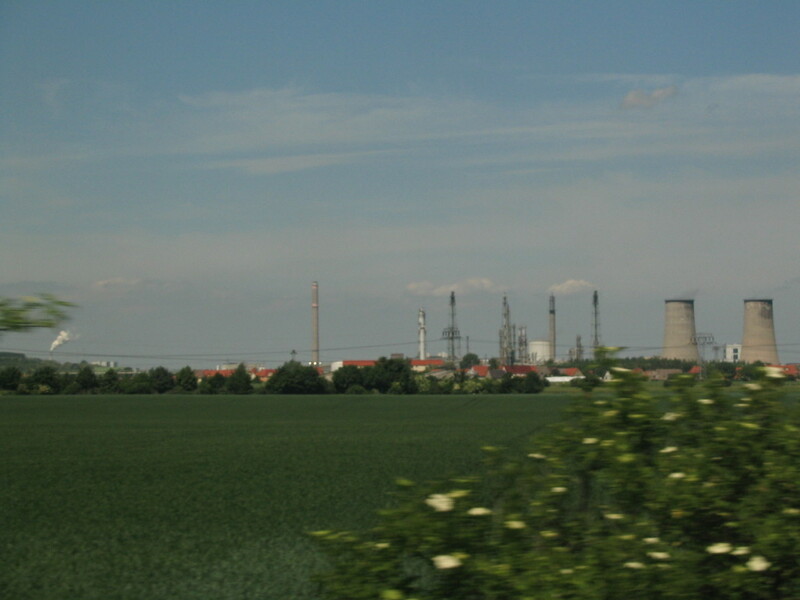 A delectation of towers and stacks. 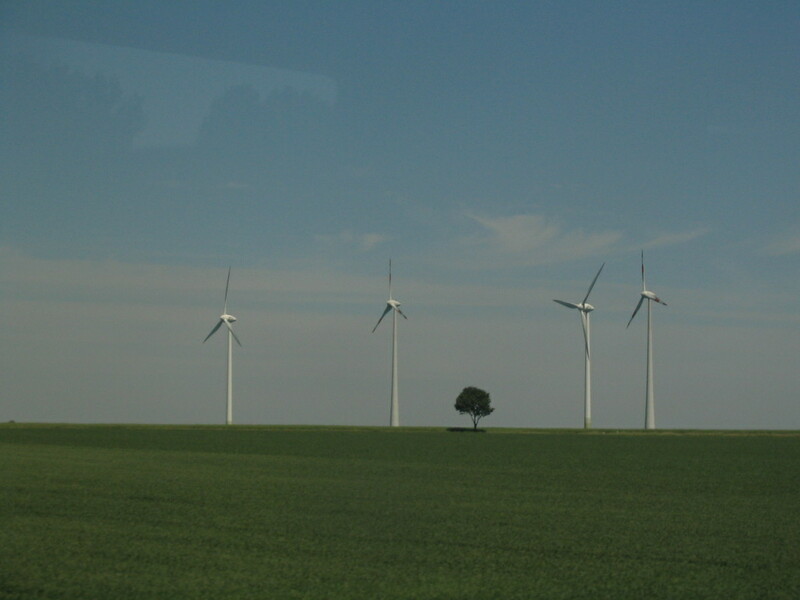 More turbines, and the ghosts of houses in the sky above the wires. 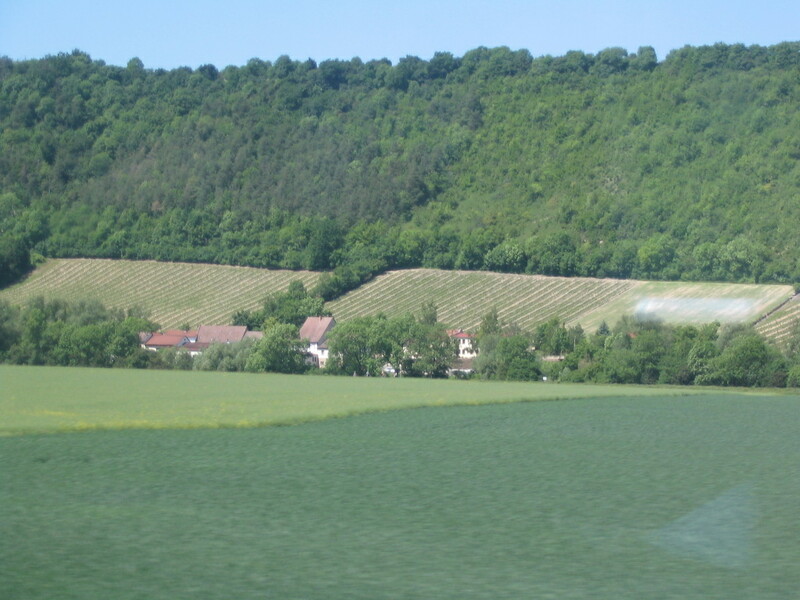 Suddenly, surprisingly, a ridge with a vineyard. 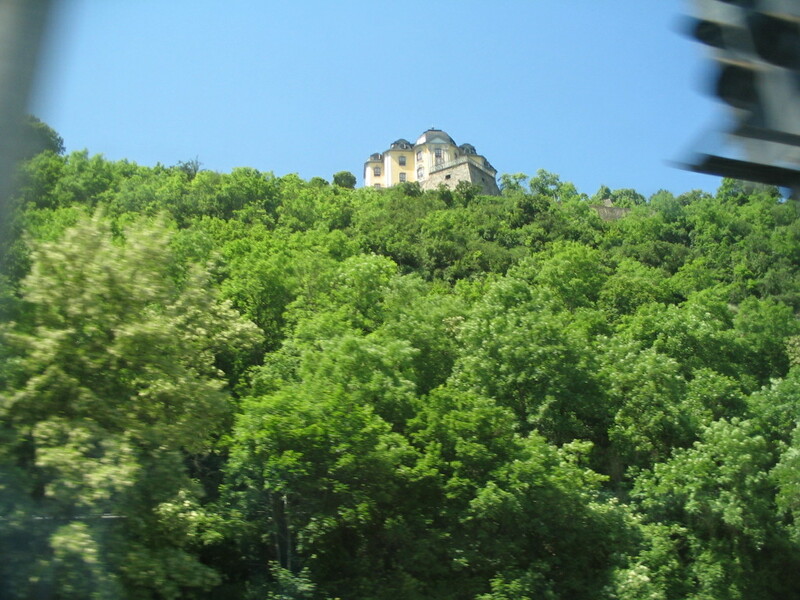 A briefly visible chateau on high, between railway posts. 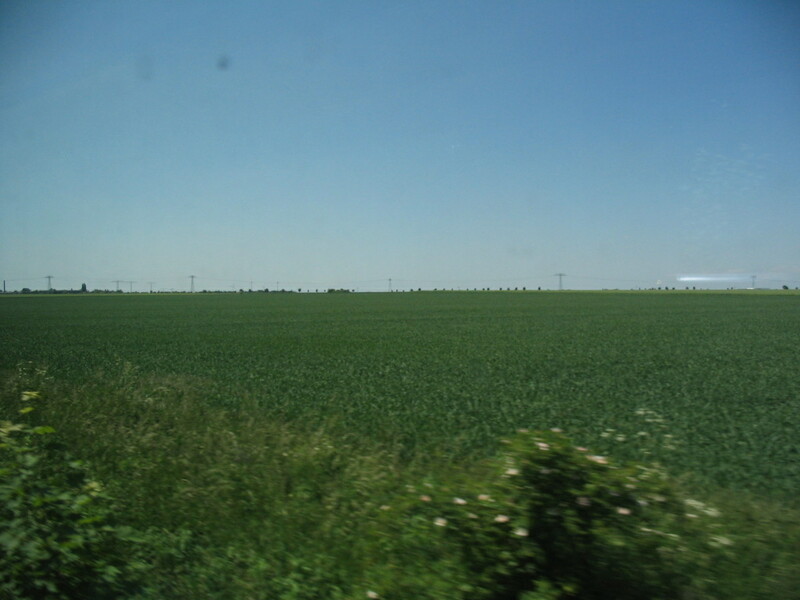 At this point, as you can see, the terrain was much hillier and I think the railway was more winding; at this point we were in Thuringia. 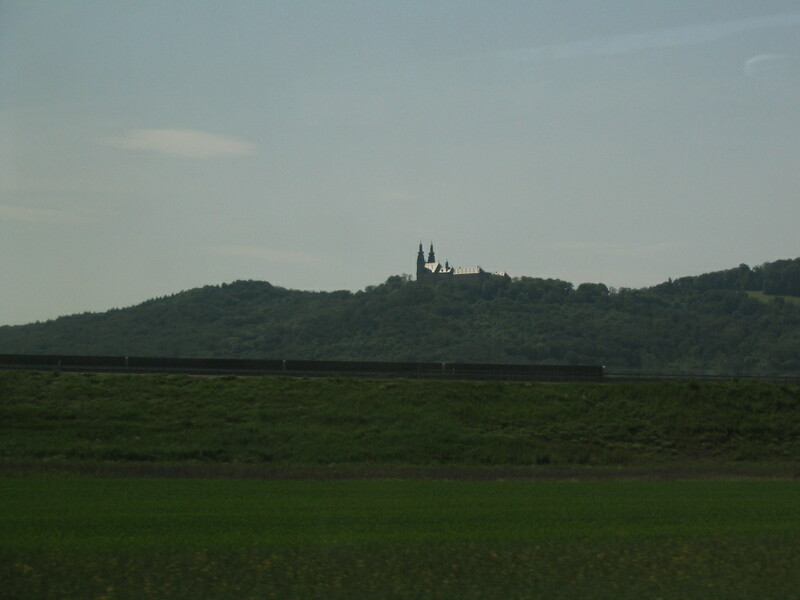 Winding through the wooded hills on the train is my singular recollection of Thuringia. 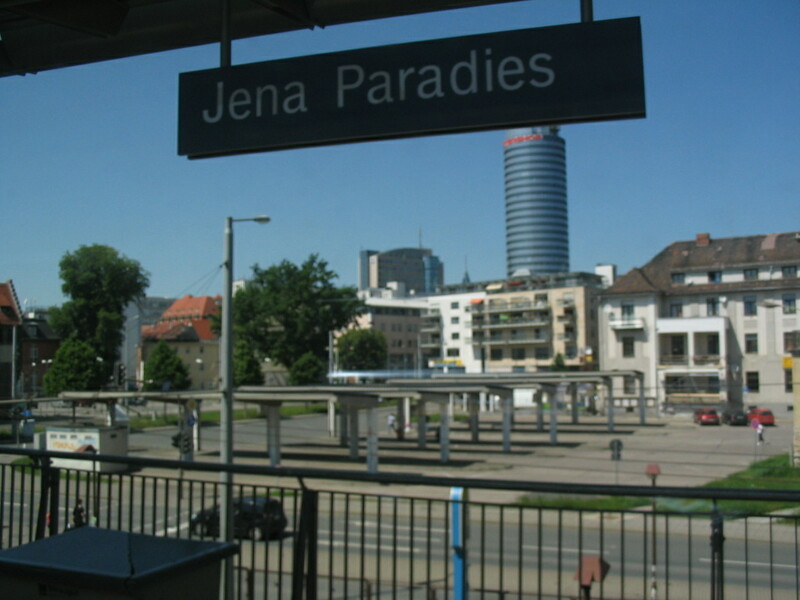 An apparition of Jena Paradies station and Jena beyond. 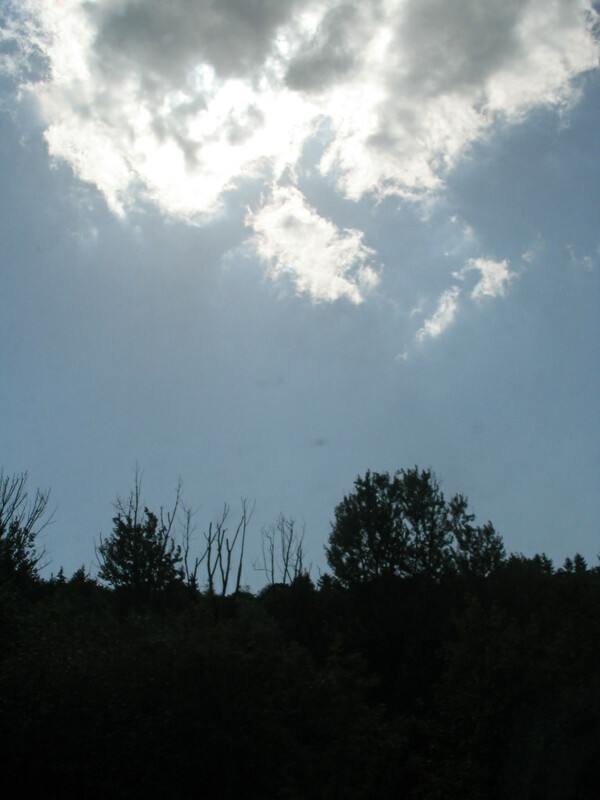 The "Paradies" comes from the name of the adjacent park. 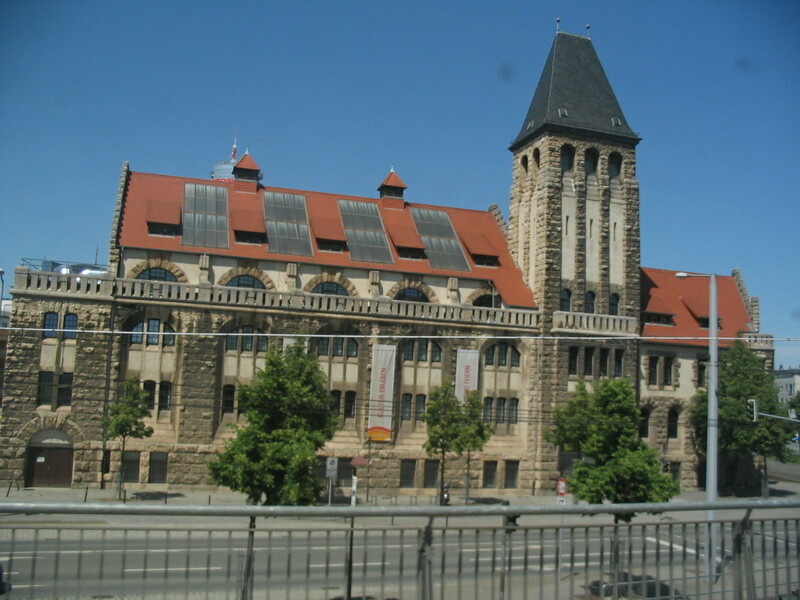 I can't tell whether the panels between those dormers are photovoltaics or skylights or something else. 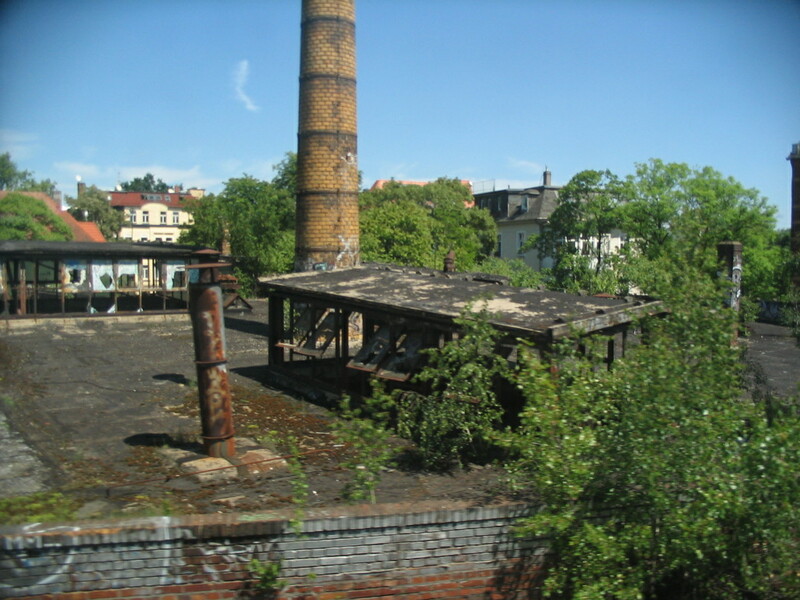 You can glimpse the cylindrical tower from the previous photo behind the building, while in the previous photo you can glimpse this building way at left. 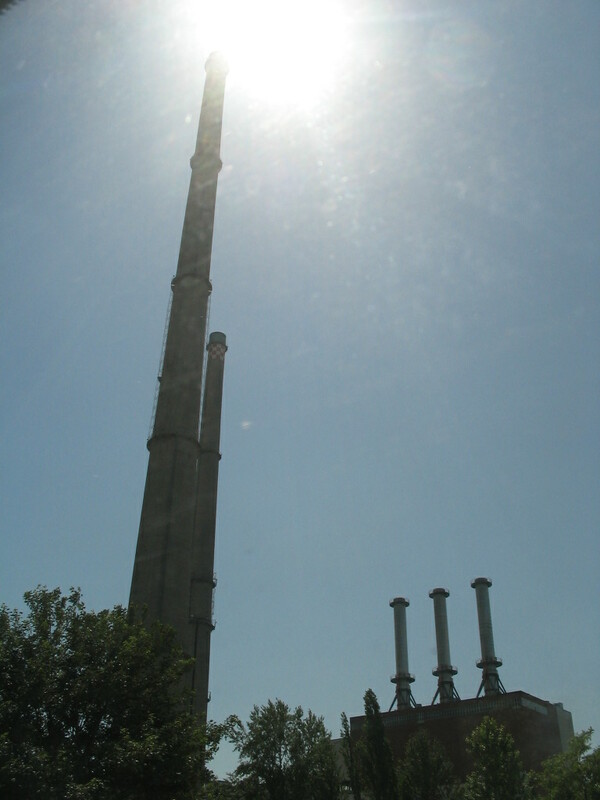 Icarus smokestack plus a few Daedalus smokestacks. Another Estonian-flag scene, following that at Nuuksio. A little view of, I think, Probstzella. 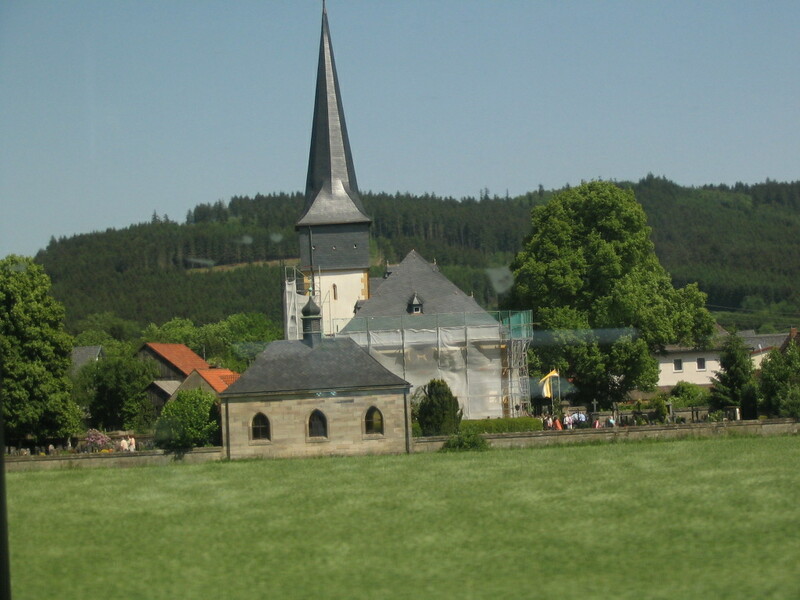 This was just before passing from Thuringia into Bavaria. 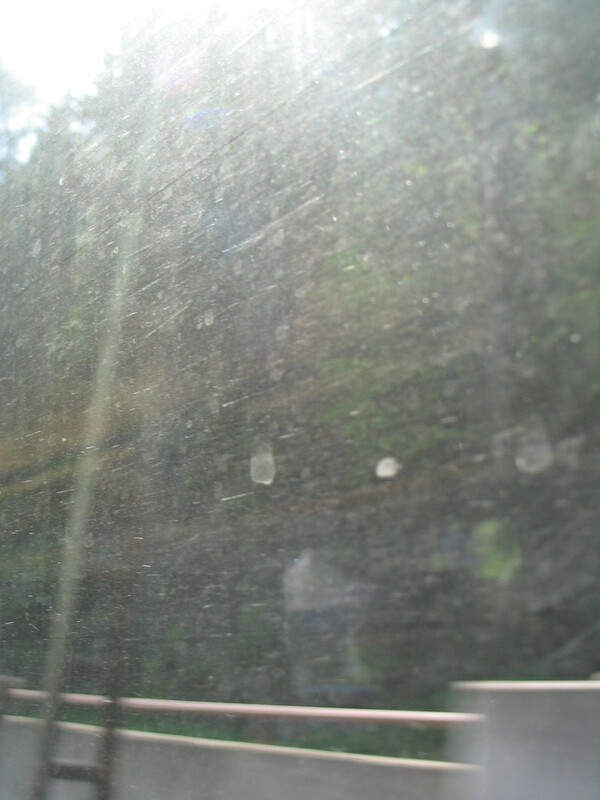 My window was well gauzy. Look at the tiny windows in the steeple! 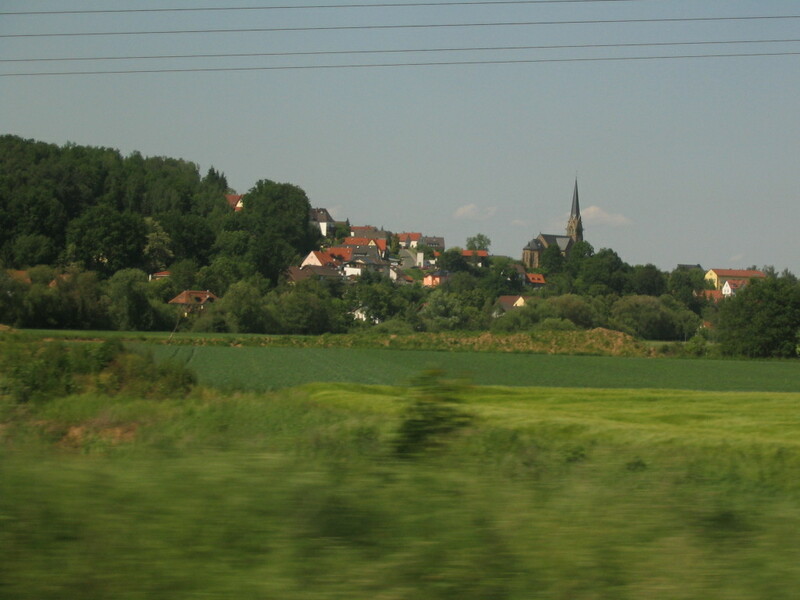 Speeding by an unrecallable hillside town. 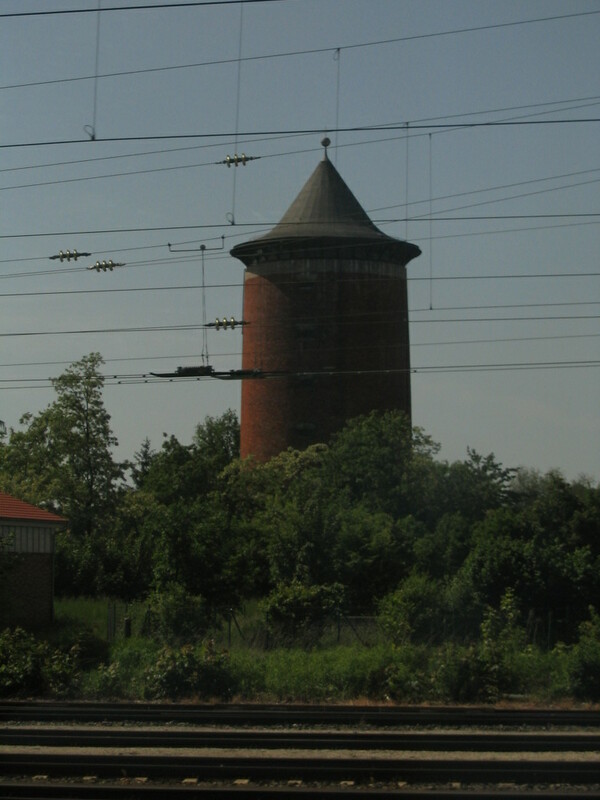 A cool old cylindrical tower.